VVIP Preview, likewise referred to as soft launch, of brand-new home launches is an unique invitation encompassed interested buyers prior to its actual launch. The idea behind this is to enable the developer to gauge the response from the general public prior to launching the development. Normally, the prices during official launch are often higher than throughout preview, purchasers will certainly find this time the best to secure their piece of the development. This is because for units of high demand, developer will raise the costs of subsequent unis when the new-launches are out. It will increase by batches till the whole development is sold. 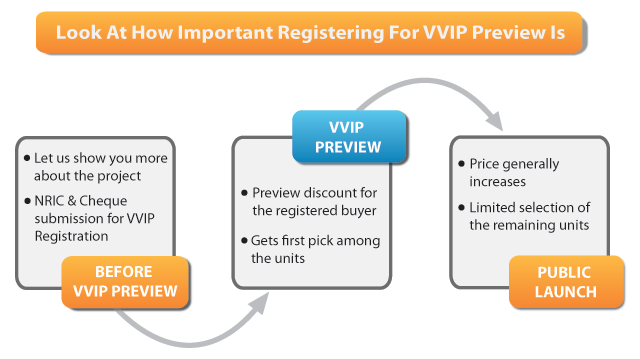 In other words, VVIP Sneak peek enables you to be one of the first to view the showroom and provides you the opportunity of securing your choice units at the very best price. Priority booking is of your choice units is a must as there may be other buyers looking at your chosen units. Hence if you do not make a booking, these units may be gone on the preview day. Priority bookings also allow you to secure your units without the need of visiting the showroom on preview day itself. Sometimes balloting may also take place if there are more than two buyers placing bookings for the same unit. Therefore participating in priority bookings will give you the best chances in securing your choice units. However, please be assured that there are absolutely no obligations in this procedure. Upon the price release on preview day, you can decide if you want to go ahead with your purchase or to withdraw if you are not comfortable with the price. How to book your unit/s? 1) We will guide you in choosing your preferred stacks and storeys upon meeting up with you. 2) We will then help you in completing the Authorization Form, collect a cheque from you and make copies of the buyers’ IC for the registration. On preview day, you will come to the showroom to wait for the price release. If you are happy with the price upon its release, we will go ahead with the purchase. However if you are not, we will return you your cheque at the showroom. There are absolutely no obligations and it only serves to benefit you as a potential buyer.